The United States are apparently set to reconsider a long-standing ban on the import of Scottish haggis, thanks to an appeal by environment secretary Owen Paterson. The delicacy has been off the menu for over 40 years across the pond because a key ingredient to the dish, sheep lung has been banned in the US since 1971. Paterson is scheduled to meet officials from the Obama administration at a time when the country has opened its market back up to British beef for the first time in 20 years. 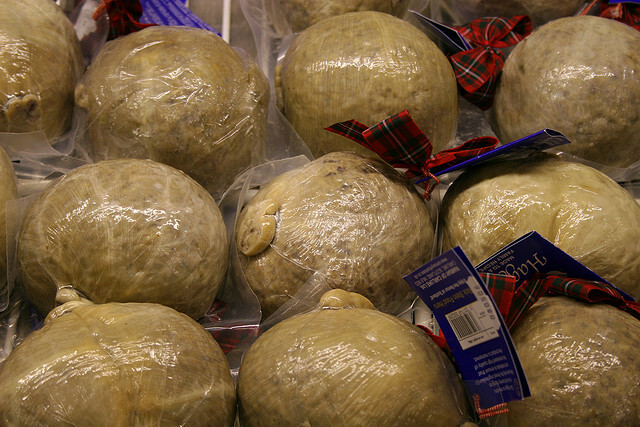 Haggis is not the first, nor will it be the last product to be banned on foreign shores. There are a number of products which have been banned over the years across the globe, for this reason or that. Some are weirder than others. Kinder Surprise – Children, and now adults who grew up with this sweet confectionery, adore a good Kinder Egg in the UK, but don’t expect to find them on US soil. They’ve been barred from import by US Customs and Border Protection because the toys you find inside the egg are a choking hazard. Now, as someone who grew up buying and collecting the toys inside once a week with my pocket money, I can honestly say I never tried to swallow the plastic capsule the toy comes inside, but hey, perhaps other kids aren’t so bright? Vegemite – Australian expatriates in the US have been in a pickle since 2006, because the US cracked down on their ban of Vegemite, to the point of searching Australians when they enter the country. The US Food and Drug Administration banned the iconic product because it contains folic acid, which they only allow to be added to breads and cereals. We’re certain the US wasn’t a big market for Vegemite anyway. Google Glass – okay, so the latest gadget from Google hasn’t been banned from distribution in the UK, but cinemas have banned use of the headsets in their theatres. It’s feared people will use the gadgets to pirate copies of Hollywood blockbusters, thus losing the cinema chains and the film industry millions in revenue. There are privacy concerns about Google Glass’s ability to record people without their knowledge with the stroke of a finger or a voice command too, so we’ll see how this debate pans out in the near future. Jelly Sweets – What’s wrong with a good old jelly sweet? If they contain a thickening agent called E425 Konjac, the UK and EU have issue with them. Apparently if they contain this agent, they are more likely to be a choking hazard for children, because their plastic cup packaging encourage you to eat them in one gulp. These sweets are still sold in Japan and the Far East, and alternative jelly beans are widely available across the UK, so it’s not a big loss. Ketchup – The French are a peculiar bunch. Ketchup has been banned in French primary schools since 2011 because the delectable sauce that pairs so brilliantly with chips, is a threat to traditional French cooking. Apparently it “masks the taste of the food you are eating and kids will not appreciate the meal they have been given properly. I thought the whole point of Ketchup was to allow people the choice to mask (or enhance) a taste they don’t like, but hey, I’m all for future generations maintaining the standard of French food. Marmite – It’s true that you either love it or you hate it. As far as Denmark are concerned, they really really hate it! What’s so bad about Marmite that an entire nation would ban the product? Apparently food products are not allowed to be fortified with vitamins in the European country as of 2004, so the product with yeast extract has been struck from Danish shopping lists. Ah well. Rice Crispies also come under this category, funnily enough. → EU Right to be forgotten – what’s it all about?